hi, it’s vanessa. where are you????? The clock in my kitchen is my go-to for all my timely needs. There are other clocks around the house, but for some reason I always consult the kitchen clock for accurate time. Oddly enough, the five minute intervals read “now” instead of numbers, so time telling is a two step translation process – a process that perhaps took the edge off last night as I was watching that minute hand in orbit, converting “nows” into numbers, waiting for my husband to come home after work. We were all hungry, dinner was hot. Around 6:0o I called him four times in quick succession. I thought the intensity of my effort might encourage him to pick up, mentally willing him with every ring. No dice. So finally at 7:00 I sat the crew down to eat. Dinner was typical. The girls chowed down while my son staged a sit-in across the kitchen. We ate the last half of our meal in intentional silence, doing our best to focus on chewing and tasting. In the silence I had a hard time focusing on anything really. Well, anything but this: Where the hell is my husband??? As the “nows” accumulated, one nagging, irrational thought snagged its claws on my otherwise typical thoughts. If he got into an accident, the hospital would have called me, right? Would I have a sixth sense if he was dead? Would I just know? He’s not dead, though. But he could be. No. Could he be? I’m sure he’s fine. Maybe I’ll watch a little TV. The phone finally rang after I put the kids to sleep. He was fine, enjoying dinner with a friend visiting from out of town. He had actually told me several times he had plans but I forgot, didn’t write it down, screwed up. Oops. All that worrying for nothing. 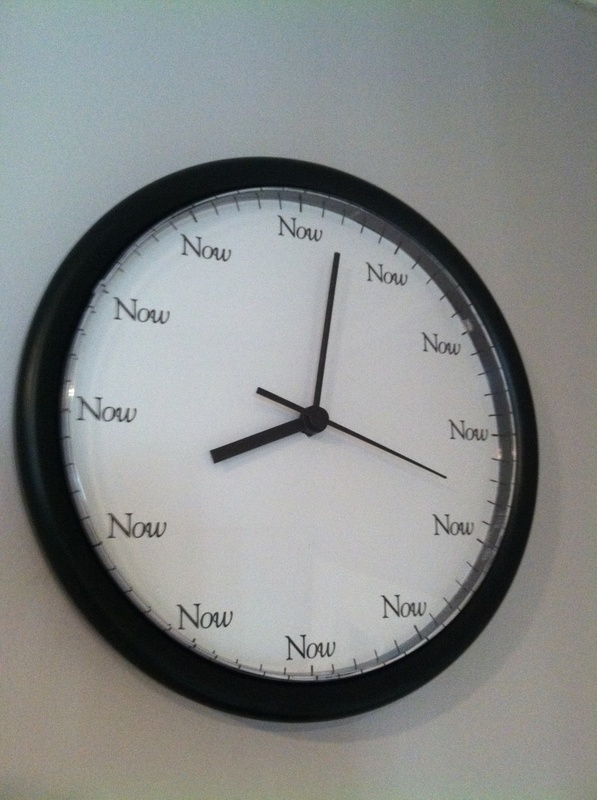 It’s not as if I didn’t have a gentle reminder telling me to be here and “now”. Jeez. His plane went down over Los Angeles last week, again. Or was it Long Island? Boxer shorts, hair gel, his toothbrush washed up on the shore of New Haven, but his body never recovered, I feared. Monday he cut off his leg chain-sawing. Bleed to death slowly while I was shopping for a new lamp. Never heard my messages on his cell phone. Where are you? Call me. I told him to be careful. Tonight, 15 minutes late. I’m sure he’s hit a moose on Route 26. Someone from the hospital will call me, give me his room number. I’ll bring his pajamas and some magazines. 5:25, still no phone call. I turn on the news, wait for the report. Flashes of moose blood, his car mangled, as I buzz around the bedroom dusting the furniture, sorting the sock drawer. I follow with a scowl: Where the hell were you? Couldn’t you call? Translation. I die each time I kill you. p.s. If you like this article, please consider sharing it on social media. Thank you! Been there, done that with hubby! Now, going through it with 3 teenagers!!! I could relate to the poem. Thank you for allowing me to realize I’m not the only one. Love it. And I did laugh out loud at the poem.